You can send a gift to a pal from your pal list, or from their profile. Or you can send a gift to anyone in a chat room. When viewing your pal list, tap on a nickname then select ‘send a gift’ from the menu that appears. 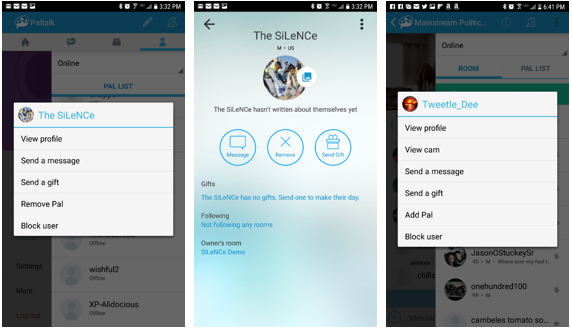 If you are viewing a profile, tap on the ‘send gift’ button near the middle right of the profile screen. Tap on any name in a chat room’s participant list and select ‘send a gift’ from the menu that appears. Scroll up and down through the different types of gifts that are available. Gifts are categorized by type. ‘Paltalk Gifts’ are subscriptions that you may send. Gift subscriptions last for one week, or one month, you pick which one you want to send. Tap on any gift to select it. You can enter a message to send along with your gift. Tap the ‘purchase gift’ button near the bottom of the screen to confirm your purchase. 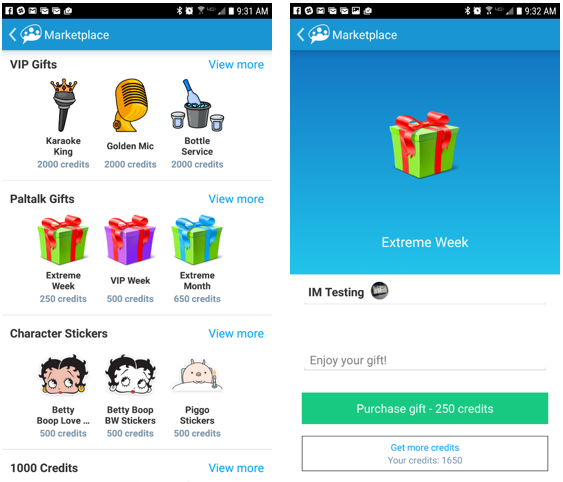 Credits will be deducted from your account once you tap the ‘purchase gift’ button. Purchases or not reversible or refundable so be sure that you have selected the right person and have chosen the correct gift before you complete your purchase. Your credit balance is shown under the ‘purchase gift’ button. There is a link to purchase more credits there too, just in case you want to add more to your account.